Dr Mullassery, the Vicar-General of the diocese, was appointed in place of Dr Stanley Roman who stepped down. Bishop elect Paul Antony Mullassery with former Bishop Stanley Roman. Kollam: Mon. 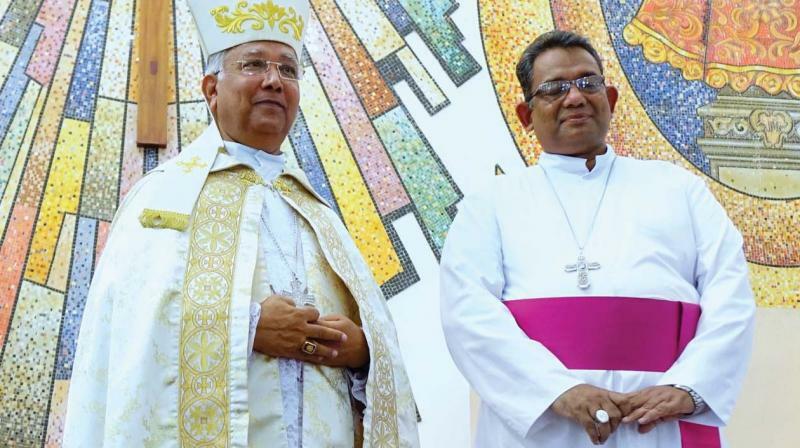 Paul Antony Mull-assery was appointed as the new Bishop of the Kollam Latin Catholic diocese on Wednesday. Dr Mullassery, the Vicar-General of the diocese, was appointed in place of Dr Stanley Roman who stepped down. The consecration ceremony was led by Dr Stanley Roman at the Thangasseri Cathedral. He read out the news of the appointment by Pope Francis. Mon. Paul Antony Mullassery was born to Margareta and Antony Gabriel of Kaithakkodi in Kanjirakkode under Kollam diocese on January 15, 1960. On completion of primary education in Kanjira-kkode St. Margaret LP school, he joined St. Raphael seminary in 1969. He completed his schooling from Trinity Lyceum and joined Pontifical seminary in Aluva in 1978. He was ordained a priest on January 22, 1980.